Mosaic artist Stephan Wanger, with the help of over 2,500 tourists and volunteers, completed a 42' ft long and 8' ft tall - massive artwork, after 100 days on Feb. 22, 2013. In the process, this giant undertaking raised $13,000 for five local organizations. The new Guinness World Record for the Largest Mosaic made out of Mardi Gras Beads called "Paragons of New Orleans" was completed on Feb. 22, 2013. 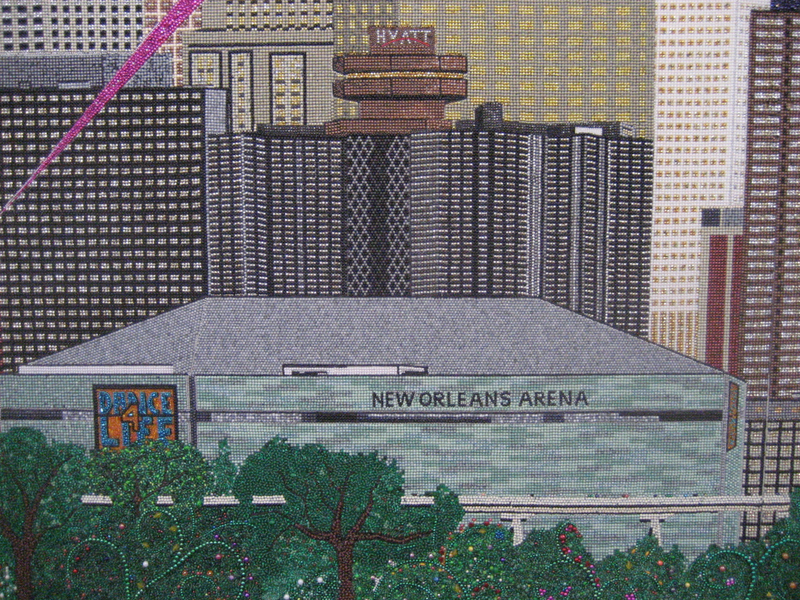 The artwork measures 42' ft (length) by 8' ft (height) and contains over 1.5 million single cut Mardi Gras Beads. "Paragons of New Orleans" was created by Stephan Wanger of Galeria Alegria. The project was started in order to create awareness for Mardi Gras Beads Recycling Centers in New Orleans, "The Arc of Greater New Orleans http://www.arcgno.org/" and "St. Michael Special School http://stmichaelspecialschool.com/oo/index.htm." Every year when Carnival season is over, up to 10,000 tons of unwanted Mardi Gras Beads wind up in landfills. "We are extending the lifespan of these beads in every fun way imaginable by simply creating art," said German born artist Stephan Wanger. (http://en.wikipedia.org/wiki/Bead_Town). 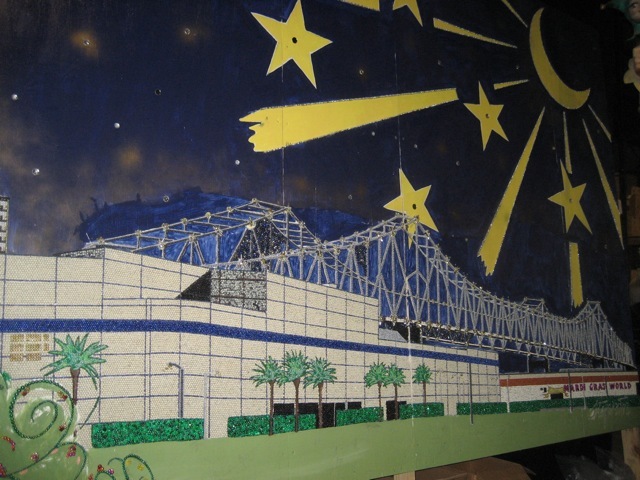 The project started at Mardi Gras World mid November, 2012 and was completed Feb. 22, 2013. "Paragons of New Orleans" was created with lots of help. Over 2,500 tourists while visiting Mardi Gras World placed a bead. Many loyal volunteers helped on a regular basis, including Alexandria Bozeman﻿ (600 hours), Nancy Crawford﻿ (300 hours), Sarah Vaz﻿, Jennifer Allen﻿, Jennifer Culicchia﻿, Jackie, Lola, Rosie and so many others. The artwork raised $13,000 through the Super Service Challenge (Companies with a Mission) for the Andrew Wilson Charter School ($5,000), St. Michael Special School ($3,000), The Jefferson Chamber Foundation Academy ($2,000), St. Paul's Homecoming Center ($2,000) and for The Arc of Greater New Orleans ($1,000). "Paragons of New Orleans" honors the countless gems of New Orleans, i.e. 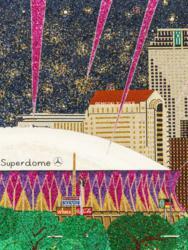 the Louisiana Superdome, Mardi Gras World, The Crescent City Connection or the famous Sewerage and Waterboard's Watermeter Design. "Paragons of New Orleans" is currently on display in the City of Slidell at the "Bead Town: Slidell, LA" exhibit in the old Feed Store until April 5, 2013 and the exhibit will travel next to Denham Springs, Natchitoches, Thibodaux, Minden etc. Visit http://www.galeriaalegria.com for more information. "Paragons of New Orleans" was made possible by the generous help of Mardi Gras World, Metrowide Apartments, Caserta Architects, North Productions, and Pokorn Construction. In preparation for the formal construction of each piece, beads are meticulously sorted by size down to the exact millimeter and perfect shade, creating a detailed and varied palette much like a painter would for painting. The resulting play of light and color recalls several Post-Impressionistic artists' works while adding a new dimension of glitter and shine through the use of metallic, plastic and luminescent beads. The illusion of three-dimensional space is often created through the use of perspective but also the variety of sizes of the beads he uses to create actual dimension add an element of bas-relief. The finished works are stunning to regard both from a distance and upon close inspection of his fine craftsmanship. Part of Mr. Wanger's goal is in using recycled materials for his pieces. Not only does he collect discarded beads throughout Mardi Gras in an effort to clean post-parade debris, but also, he regularly visits salvage yards to gather additional materials for his work. Through his art, Mr. Wanger hopes to inspire the citizens of Louisiana to recycle and to create, and the rest of the world to appreciate and gain fondness for the unique culture and natural beauty that Louisiana has to offer. Mr. Wanger's mosaics works can be seen online at http://www.galeriaalegria.com.